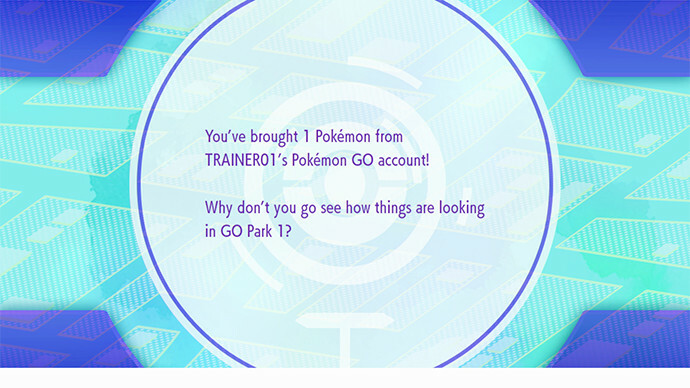 » Content DB » Transfer Pokémon from Pokémon GO to Pokémon: Let's Go! Players of Pokémon GO can transfer the Pokémon they have have caught over to Pokémon: Let's Go, Pikachu! or Pokémon: Let's Go, Eevee! Players need to first pair their Pokémon GO account to the Nintendo Switch game before any transfers can take place. 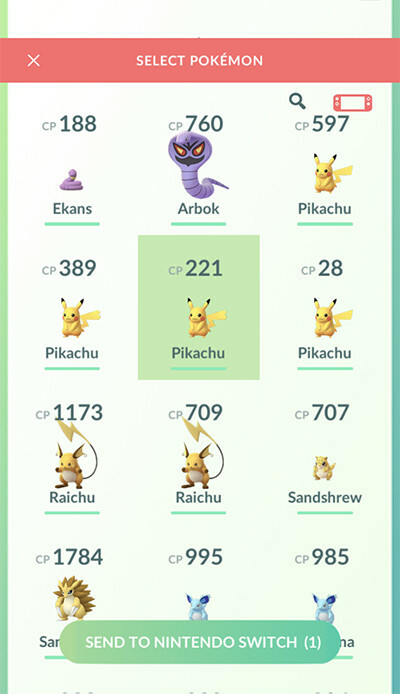 Once Pokémon are transferred to the Pokémon: Let's Go, Pikachu! 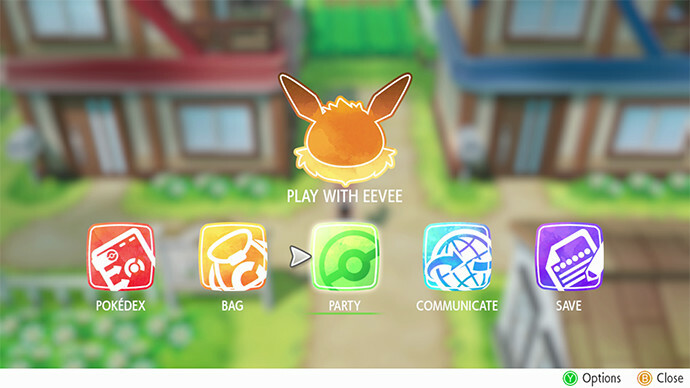 or Pokémon: Let's Go, Eevee! 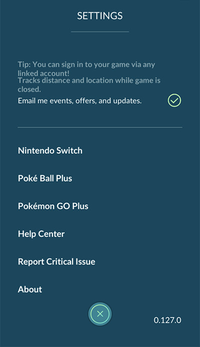 Nintendo Switch games, they cannot be returned to Pokémon GO. 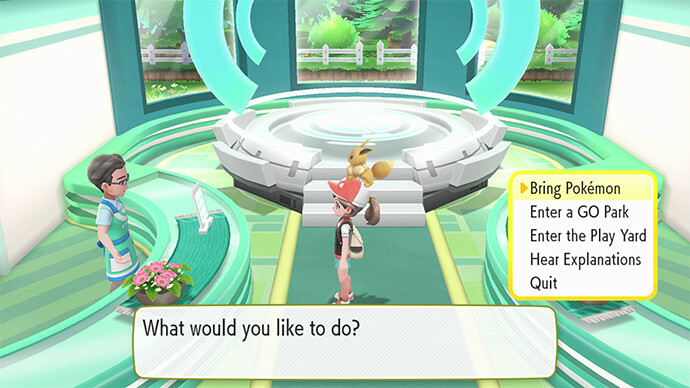 Pokémon originally discovered in the Kanto region including Alolan regional variants, as well as Meltan and Melmetal, can be brought into Nintendo Switch games. Some of the special Pokémon that can be caught in Pokémon GO are not moveable. The information on Pokémon such as its nickname and its ability will change after they are brought into the Let's Go Nintendo Switch games from Pokémon GO. 1. 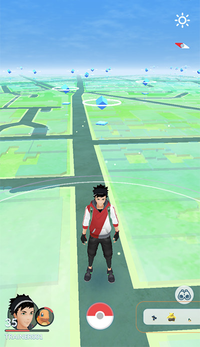 Tap the Poké Ball icon in Map view. 2. Tap SETTINGS at the top right corner. 3. Tap Nintendo Switch. 4. 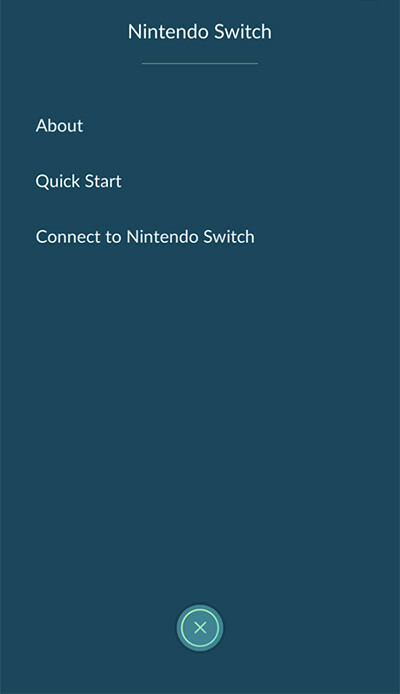 Tap Connect to Nintendo Switch. 1. Press “X” to open the main menu, and select “Options.” 2. 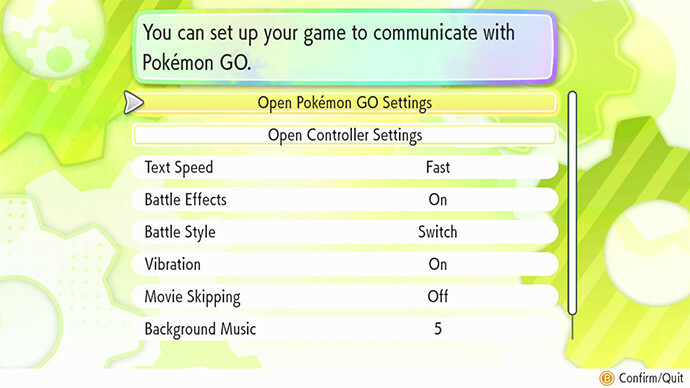 Select Open Pokémon GO Settings. 3. 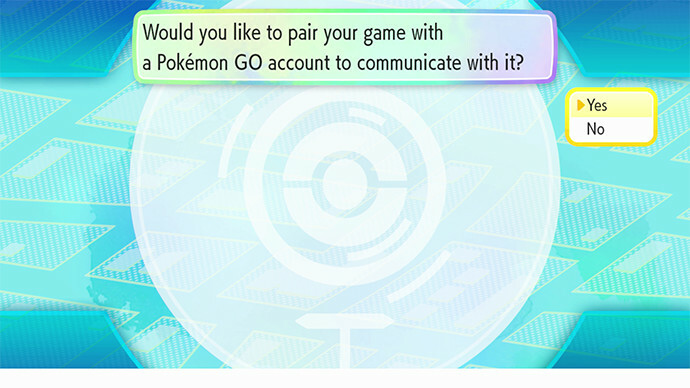 Choose Yes to confirm that you wish to pair your game with a Pokémon GO account. 4. Choose Yes to confirm that your Trainer name is correct. 5. The pairing complete message appears. 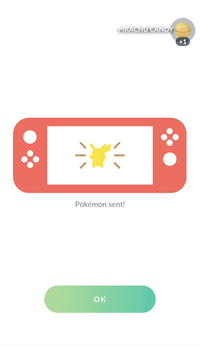 Transfer Pokémon from Pokémon GO to Pokémon: Let's Go! 1. Tap the Poké Ball icon in Map view. 2. 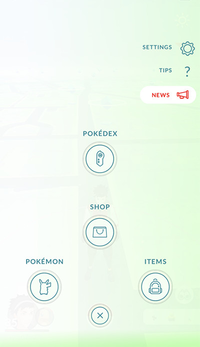 Tap the Pokémon icon at the bottom left. 3. Tap the Nintendo Switch icon at the top right. 1. Select Bring Pokémon. 2. 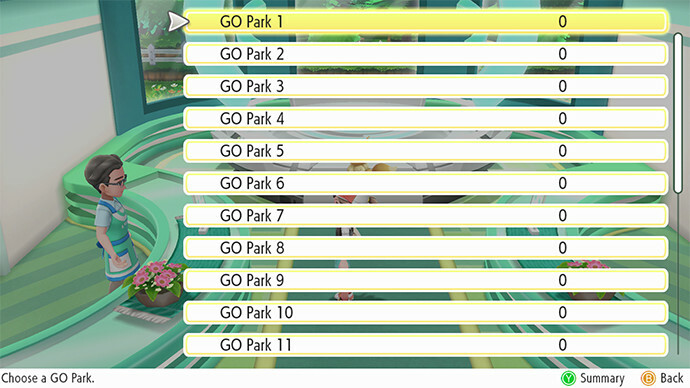 Pick a GO Park to which to send the Pokémon. 3. Choose Start Communication. 4. Choose Yes to complete the action. 5. 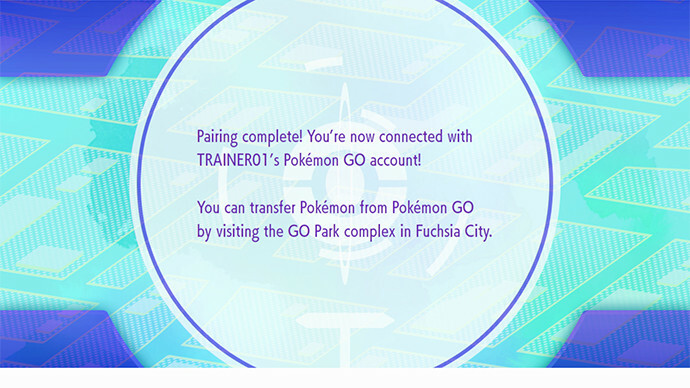 The transfer completion screen appears. 6. 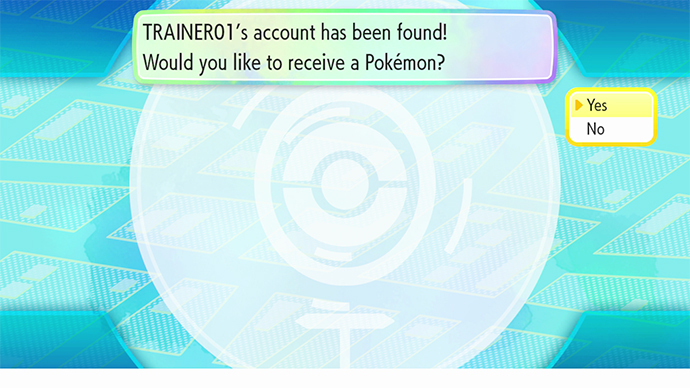 Pokémon Sent! 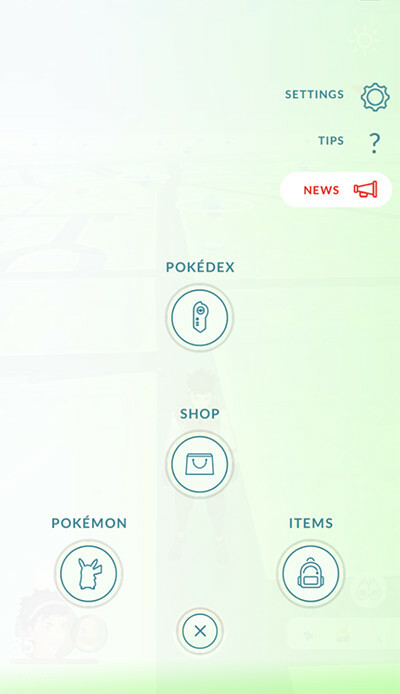 appears on your Pokémon GO screen. 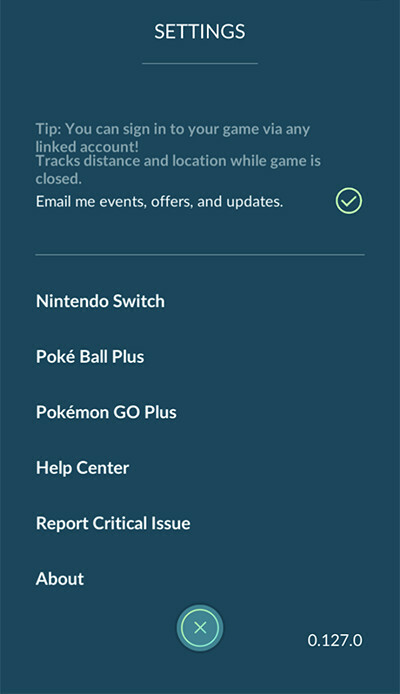 While transferring Pokémon from the smart device app Pokémon GO to the games Pokémon: Let’s Go, Pikachu! or Pokémon: Let’s Go, Eevee! 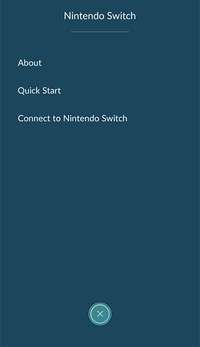 on Nintendo Switch, if the connection is interrupted, the app may not be able to resume transfer. 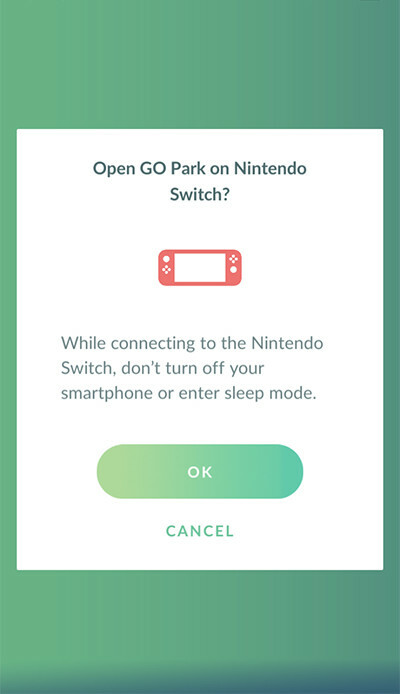 However, users will be able to continue to play the game once they exit the transfer screen. 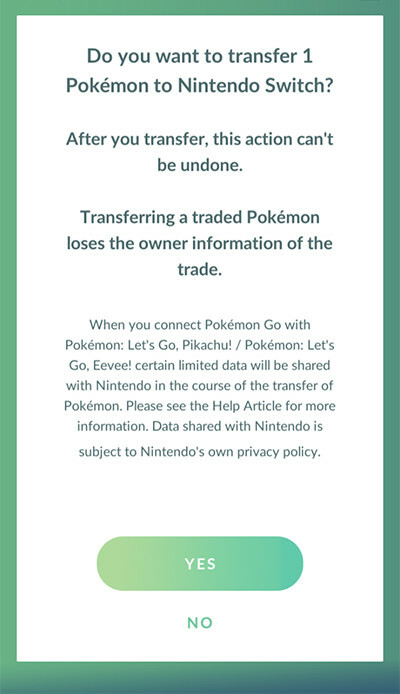 If the Pokémon GO app gets disconnected while transferring Pokémon to Nintendo Switch, there is a chance that the resume transfer function would no longer work. Pressing the HOME Button or the POWER Button on the console. Pausing the app, pressing the HOME button, or turning off Bluetooth settings on the smart device. Having too much distance between the Nintendo Switch console and the smart device. Last Resort: Uninstall the Pokémon GO app from your smart device and then reinstall it. The Pokémon may become lost and cannot be recovered, as uninstalling and reinstalling the app would cause the transfer process to be stuck in limbo. 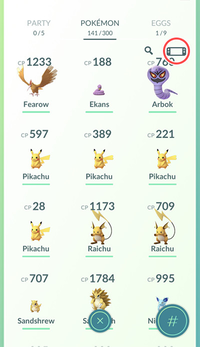 Tag List: Pokémon GO,	Pokémon: Let's Go, Eevee!,	Pokémon: Let's Go, Pikachu!